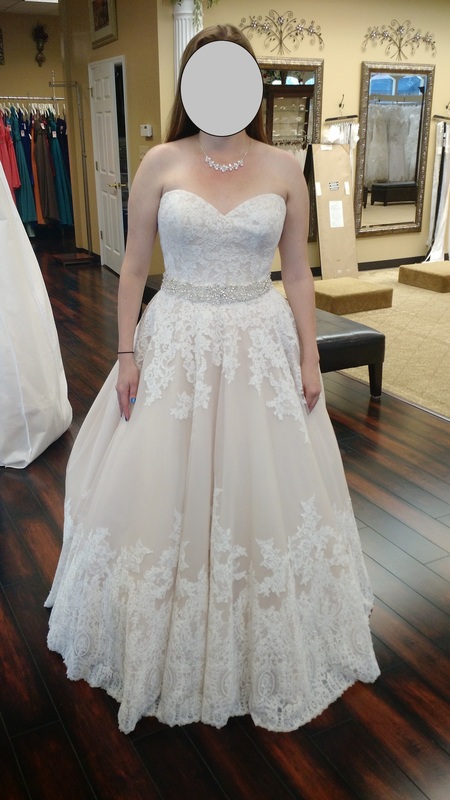 I need help on what to wear for jewelry with my dress. I'm thinking a necklace similar to the first picture with small stud earrings or no necklace and bigger earrings (similar to the picture here). I'll be wearing a veil for the ceremony only. 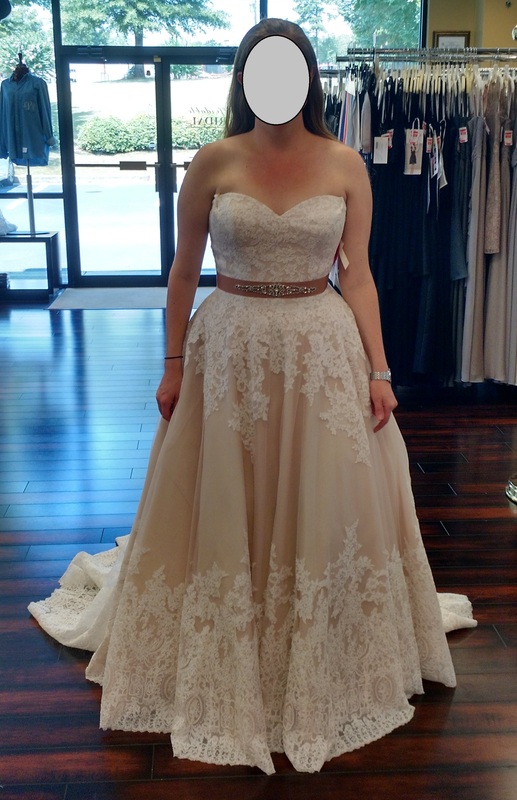 Also, my dress has the sparkly belt from the first picture sewn on now - the other picture is from my first fitting and I didn't like the brown belt. Your dress is beautiful! My neckline is similar and I also have a crystal belt sewn on to my dress. I am not wearing a necklace, I think it competes with the sparkly belt but I also rarely wear necklaces as it is, so it's more comfortable for me to not wear one. I am wearing similar earrings to the picture you posted. I really do not like necklaces with wedding dresses. I think that many times they just take away from the dress then add to it. So I would go with the earrings you attached and maybe a simple bracelet and/or hair comb (or other hair accessory depending on how you are wearing your hair). Mostly agree with Maggie. Those earrings are the bomb, and the choice for the sparkly belt is a good one. The brown one draws the eye so strongly to the waist of the dress that it distracts from the overall picture. Thanks ladies! I decided against the brown because of the bridesmaids dresses. Your dress is beautiful - love the crystal belt. I prefer a classic elegant look - maybe a necklace with both pearls and rhinestones would be a nice compliment to your gown and earrings. If you go with a crystal necklace I'd keep it very soft and petite so as not to distract from your face or gown. I'm sure you will look gorgeous! My vote is for earrings & no necklace. In the first photo I think the necklace competes too much with the dress & belt. If you want a touch more bling, add a bracelet. Sorry to show up to the party so late, but I wanted to agree with Baluvia. 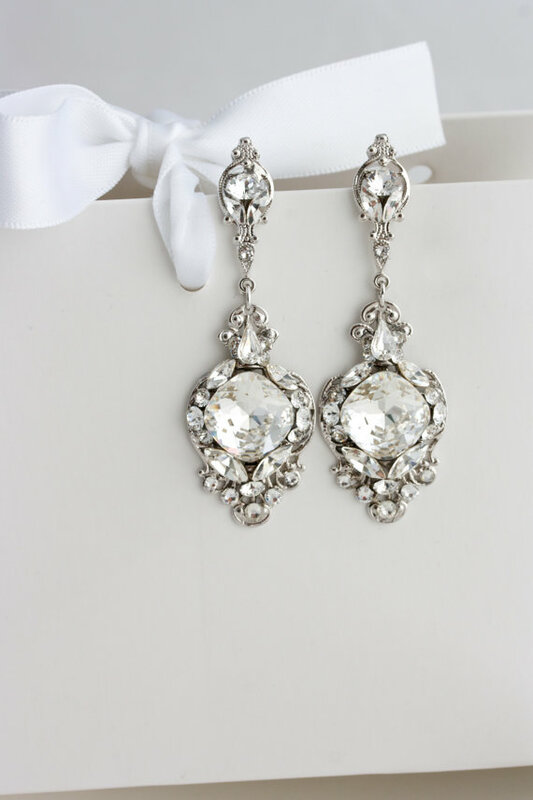 If you're into the necklace idea (sometimes a strapless dress feels naked without one), a solitaire crystal or diamond would look great with those earrings and (gorgeous) dress.